Cool interviews on what makes us happy from TED. Here is a video from Martin Seligman on positive psychology. He also wrote a great book called Authentic Happiness. One of my favorite programs is ScreenshotCaptor. Basically it is a little tool for taking screenshots of your desktop. Normally you can press 'prtsc' or 'print screen' on your keyboard and it will snap your entire desktop. But, if you just want a part of your screen, by turning on ScreenshotCaptor and pressing shift+prtsc, a little cross shaped icon will show up and you can select just part of the screen you want. I've been using this program for 3+ years now. At work the other day, my coworker showed me his Flip video camera. That thing is pretty cool. It is very tiny, about a little bit bigger than a cigarette box or similar in size to an ipod classic. He just pressed a button and recorded a video himself pretending to pick his nose. Hehe. Anyway, there is a little USB mini-connector and you can plug the camera very easily into your computer and transfer the video. Wow. So quick and easy. I thought it was a pretty cool gadget and really reminds me more of Clayton Christiansen's work on disruption. This little simple gadget is definitely a low end disruptor. It does not have half the features of most video camcorders but it is cheap and functional. I think it is opening the video recording market to a whole new segment of users who were not going to buy an expensive camcorder anyway. I think they are getting the non-consumers. Flip apparently has 13% of the camcorder market and has sold 1 million units. You can get a Flip Camera yourself at Amazon for $115. I just discovered posterous. I love it. Posterous is a blogging website that uses email as an input device. This is totally in line with my view that email should be integrated with our lives. Basically you just send an email to post@posterous.com and they make a blog in your name at http://yourname.posterous.com. The content of your email becomes a blog post? Isn't that awesome? If you attach images, they upload the image to the blog. If you add video, they transcode it and put it up. If you add a link to a YouTube video, they embed the video. If you attach an mp3 file, they put a player right in the page. Wow! I think they've got the user experience just right. People want a "duh, it just works" solution. Keep it simple stupid!! I have been trying to get the 'post by email' function on this blog to work for a while and it is just sort of a pain. I've been reading code, messing around with account settings..
Posterous is also trying to get integration with other cool web 2.0 services working. Basically you can set up other accounts like Flickr, Twitter, Tumblr, etc. 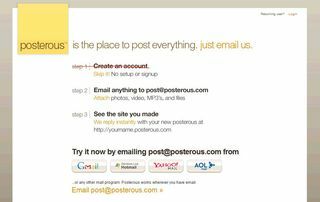 and if you email to Posterous, they will autopost on the other accounts for you. They make it so easy. Another interesting feature is they have followers and following ability. So you can see what other posterous users are following a specific blogger and whot they are following. I am really impressed with them. I guess in terms of feedback, it would be nice if you could customize your template so that your blog doesn't look like everybody else's. Basically they all look the same. Yes, I had to use the extended instructions. Unfortunately for me, the automatic plugin did not work. At all. I backed up my site first. I had to do this manually since for some reason my old backup plugin just wasn't working. I had to go to myPHPAdmin to backup the database and then I just copied over all the files from my Wordpress install folder. Then I just deleted almost all the files and unzipped the newest Wordpress version of 2.6 into the folder. I unfortunately forgot to deactivate my plugins, but luckily they are still functioning. Hurray. That is about it. It was actually really simple. All in One SEO Pack. This plugin is supposed to automate a lot of the simple things you should do to make your site more search engine friendly. It is kind obvious stuff like putting the topic of your site inbetween the title tags. Or filling out the description. the nice part is it automates it! Yes! Google XML Sitemaps. Again this is supposed to help search engines figure out what is on your site. Really easy install and no problems so far. Related Posts. I wanted to install this since I want to make sure it is easier to surface similar blog posts. I am just a lazy person and do not want to have to figure out which other posts might interest you manually. I think this is great because it will do a keyword analysis and find similar blog posts. This is all in the vein of content discovery a la Aggregate Knowledge or Choicestream. I am a big fan of content discovery. Post Ratings. This feature lets users rate the postings. Unfortunately since I sadly do not have many readers right now, there are few, if any ratings. However, I am hoping that will change one day and then I can put the top rated posts in the side bar! My favorite plugins Top 10 and Clean Archives remain. Although I think there is something wrong with the numbers in the parentheses in the archives after each post.. what the heck are those numbers?? Oh well, a problem to deal with another day. I met a woman the other day who is working at Project Better Place. Actually the company is just called Better Place now. Ex-SAP bigwig Shai Agassi launched the company and the goal is promote widespread adoption of electric cars using EXISTING technologies. Basically he wants to reduce dependence on foreign sources of oil. He has already got Israel and Denmark signed up. I guess, props to him for having a big hairy audacious goal. Although, I sort of think he is insane. There are huge huge infrastructure costs to what he is proposing. It is not clear to me that he is going to make a return on the investment required and is just going to spend massive amounts of capex before he even starts making any kind of money. That sort of makes me nervous, since projects like that tend to explode. (Remember Iridium?) He has raised $200 million, much of it from a wealthy Israeli businessperson. He is trying to create a whole ecosystem himself and is partnering with lots of players to do so. He has partnered with Nissan to develop an electric car. They are going to put in a "smart" dashboard that will calculate how far you are going and whether or not you need more energy. Consumers will pay a subscription fee similar to a phone bill or something for energy usage. I am not sure what the monthly fee will be, but let's say it is something comparable to gas today. If you spend $50 per week today to fill up your tank to get around, then maybe it will cost like $200/month subscription. But consumers will not need to own the batteries, deal with battery purchasing/storage/discarding and instead are getting a service. I am a big proponent of products turned into services, since I think that creates better accountability for whole life cycles of products and provides an incentive to use better technologies as they emerge. Plus there is a nice recurring revenue source for the service provider. :) Customers just specify the end usage they are looking for (e.g. energy for their car) and the service provider figures out the best way to give that service. Maybe today the best source is gasoline, however, if things change and suddenly bio-ethanol or whatever becomes cost effective, the service provider will transition over to that. The consumer will not have to make that decision. Plus today, when you are done with your electronic gadgets or products, oftentimes consumers just toss them out creating an incredible amount of waste. One thing I see a lot of is used computers. I imagine they could be useful in a recycle capacity for other electronic goods or even for people in developing countries. I just think there must be a better way to get used/discarded goods to people who need them. Anyway, sorry, I just went on a tangent there. So Shai wants to basically build this entire ecosystem from SCRATCH. I think there is a chicken and egg problem and he is just getting around it by spending big bucks. Kind of like if you build it they will come. 2. Catch-22 with charging stations. And when making their purchase decision, consumers will want to see the charging infrastructure already in place, otherwise, they will not buy the electric car. That infrastructure is going to be incredibly EXPENSIVE. And it will not pay off without consumers with cars utilizing the charging stations. So either you just spend all the money to put in this infrastructure or you don't put it in, but then consumers will not buy the cars. 3. Danger of technology obsolescence. Researchers in many labs are working to come up with better battery technologies, better fuel technologies, etc. What happens when one of these comes out and totally obliterates the expensive infrastructure you've built based on today's technology? If/when batteries can carry a charge supporting a car capable of travelling 350 miles and/or can be charged quickly - say in 5 minutes, what will you do with this car charging/swapping ecosystem? 4. Small geographic footprint limitation. I think this sort of idea works best also in small geographic spaces. In the bay area or in many parts of the United States, things are too spread out to justify such an investment. I think it may work in Israel or say Hawaii, but if you are in Texas and the closest town is 100 miles away, what will you do? Although I sound like a grouchy, negative pessimist, I do applaud Shai for having a big vision and doing his best to change the world in a positive way. I think we need big thinkers like him who are able to mobilize and inspire a large group of talented people towards an important goal. Unfortunately, I just feel as though this particular initiative is fraught with problems. For more information, check out this Wired article about Better Place and Shai Agassi. A writer followed Shai around for an extended period of time and chronicled the going-ons. Some recent additions to my Amazon reading list. These are things that I sort of want to buy/read but feel like I need to save money or something before I do. I'm interested in reading this because I'm contemplating starting my own business and I think it would be great to bootstrap it, or fund it through customer sales versus raising equity from external sources. I sort of find his blog annoying sometimes, but, whatever, he has written a lot of interesting things about starting a business and even created one with very little money and sold it. I am really interested in content type businesses and marketplaces, and I've found that certain markets are totally winner take all. For example, auction sites like ebay or classifieds like Craig's List are sort of winner take all markets. It is more beneficial to users on both sides of the platform if everyone goes to one place. Black swans are not supposed to exist. So when you see one, you think, impossible. Totally rare, unlikely. Unfortunately, in today's world black swans happen more often than you think. The events of September 11th, the bailout of Fannie Mae, how should we think about seeingly rare events? He takes a psychological approach, and I'd really like to get through this book - someday! I picked the audio version because it is great for long car rides and or lazing around and learning at the same time. I was just in LA and experienced horrible traffic. It is so weird how places are only 20 miles or so apart, so not actually geographically distant. BUT, it will still take an hour to get anyplace. I think our existing modes of traffic are totally due for an overhaul and I'm interested in reading this book to figure out the psychology of our driving patterns. The author discusses the rise of "non-professional" content, like user-generated content and how it's hurting our society. I am not sure if I agree with him, but given cheaper and cheaper methods for creating and distributing content, I think this topic is totallly worth thinking about. I feel like this would be a useful book to read since health and diet are very important. The author goes through our industrialized diets and assesses the lack of nourishment. This book discusses how a standardized container ship resulted in the flattening of the world. I think it makes sense. If you create standards and make it easy to ship stuff, no matter WHAT it is, then transport should become a lot more efficient. I think it would be interesting to learn about how this all came about. "1. Try what’s worked before. Look for patterns of success, ask your clients for advice and ideas on how they have been approached by other professionals (even your competition) to find out what worked and what didn’t. 2. Experiment and adapt. Some trial and error learning is inevitable as you try to master lead generation. Develop a plan and use multiple tactics. 3. Don’t let up. Be consistent. Try to do at least one lead generation thing every day, even if it is something small, that will help you get into a conversation with a prospective client. If you use calling, resolve to make an extra call a day before you leave. If you do networking, resolve to meet one more person at an event."